Welcome to our “Power Team” focus – a new feature where we will highlight an employee to offer a little insight into the wonderful people that work hard, day in and day out, to bring electricity to your home and/or business. Most of the world never really gives much thought to their local utility suppliers, we just think about it long enough to pay the monthly bill so that we may have lights, power, or gas for the next thirty days. With that being said… let’s focus on Cleveland Public Power for a moment! Where do you think our power comes from? Well we definitely aren’t generating it here for you because unfortunately, our power generation facility stopped generating power in 1977. So then how can we be a power company that supplies Clevelanders with power you ask? Well, we’ve been purchasing the power that we supply residents and local businesses with and shipping it directly to you via our transmission lines with the assistance of our Transmission Operators. 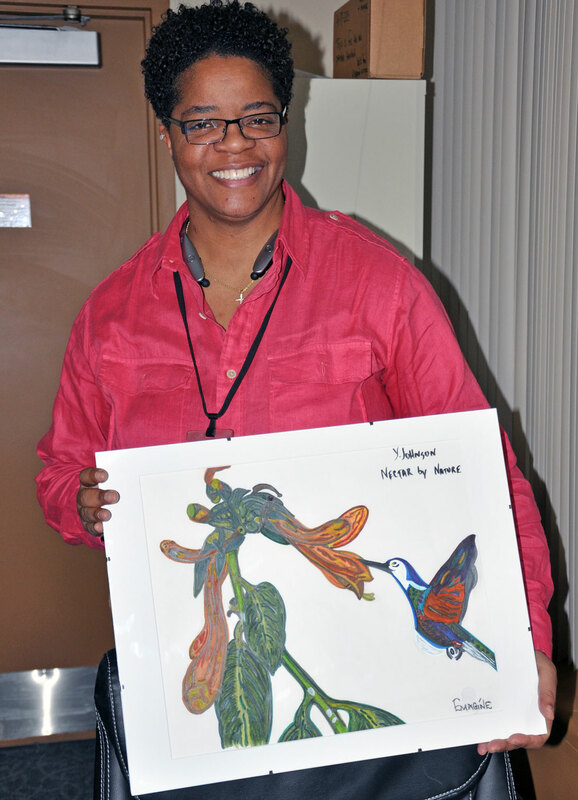 Yvettea Johnson, proudly displays her painting. This piece was on display at University Hospitals in February. Yvettea Johnson is a Senior Chief Electric Switchboard Transmission Operator at CPP and her primary responsibility is the operation of transmission for the 138kV Bulk Electric System that feeds all 36 of CPP’s Substations. She is also responsible for the monitoring of power in each of the substations as well as supervising and training the Junior Electric Switchboard Operators. It’s not a job to take lightly because it’s a position that requires a considerable amount of training and federally regulated certifications. Yvettea has been with CPP for 16 years now and has worked her way up along the ranks. She started as a Line Helper Driver (those are the people out in the field who drive the line trucks and bucket trucks and they’re required to have a Class – A CDL driver’s license), then she obtained her Journeyman’s Certification, and she’s been going non-stop… now she has her NERC and PJM Certifications which aren’t easy tests to pass, and they prove her job knowledge to be reliable and credible. When asked, Yvettea said the best thing about her job is “the experience” she’s gained. She has a vast amount of experience that extends beyond the Control Room to which she is confined to. Her hobbies include drawing, reading, interior design and donating countless hours of her time to the church. Art means freedom and life to her and she is extremely passionate about it. She has even had one of her portraits displayed at the Cleveland Museum of Art. In this article she is featured holding one of her pieces that was displayed during the month of February at University Hospital because it radiates a high level of peace. Where is the most amazing place you’ve ever been to? I was fortunate enough to go to Hawaii for 23 days last February! What is the most challenging task you’ve ever experienced? My most challenging task is not work related at all… it’s on a more personal level. It was having to watch a disease (pancreatic cancer) consume my mom’s life and take her from this earth. What is your greatest achievement/accomplishment in life? EDUCATION! I have an Associate’s Degree in of the Study of Electrical Contracting, Degree in Interior Design, Journeyman’s License, NERC and PJM Certifications. What three items can you absolutely not live without? My Daily Inspirations Book – it serves as my spiritual food, my car – because it’s my transportation to get around, and my art supplies. What is your favorite thing about Cleveland? I love the fact that Cleveland is currently on the rise. Right now it’s up and coming! What is your least favorite thing about humanity? Selfishness! If you could switch positions with anyone at your job, who would it be and why? No thank you, I would opt not to switch positions with anyone at this current time because I’m in a very fortunate position; however, I’m always open for new opportunities. Who in your life has inspired you the most? My mother and my current church reverend. Let’s just say that you’re the head chef at the fanciest restaurant in town and the King of Zamunda is coming in for dinner tomorrow night… what meal will you prepare for him? Well that’s simple… I’d make him some Alaskan king crab legs, a loaded sweet potato and some Brussel sprouts because that’s my favorite meal and I’d want him to enjoy what I love. In your opinion, what are some positive things about CPP? They are consistent with providing service to customers. They are reliable when it comes to restoration of service. They are very efficient with cost.